Good Morning, this is Capital Essence’s Market Outlook (the technical analysis of financial markets) for Thursday September 20, 2018. 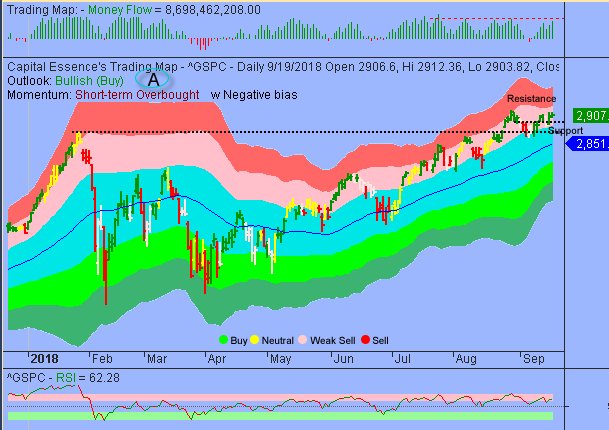 We’ve noted in the previous Market Outlook that: “while the market could continue to drift higher as trading sentiment remains strong, given the looming resistance at the lower boundary of the red band, there is no reason to accumulate stocks aggressively at this point. As for strategy, traders should consider buying into market dips rather than chasing breakouts.” As anticipated, stocks closed mixed Wednesday as strength in the financial sector offset weakness in large-cap tech stocks. For the day, the he S&P added 0.13 percent to end at 2,907.95. The Dow Jones Industrial Average rose 0.61percent to finish at 26,405.76. The Nasdaq Composite slipped 0.08 percent to 7,950.04. The CBOE Volatility Index (VIX), widely considered the best gauge of fear in the market fell more than 8 percent to close at 11.75. Bank shares rose as the 10-year Treasury note yield marched upward to 3.09 percent, its highest level since May. Goldman Sachs, Morgan Stanley and Bank of America all rose more than 2.5 percent. Shares of Citigroup, meanwhile, advanced 3.3 percent. The ETF Industry Exposure & Financial Services (TETF) rose 1.02 percent to 19.72. Now the question is whether the rally has more legs? Below is an update look at a trade in TETF. Our “U.S. 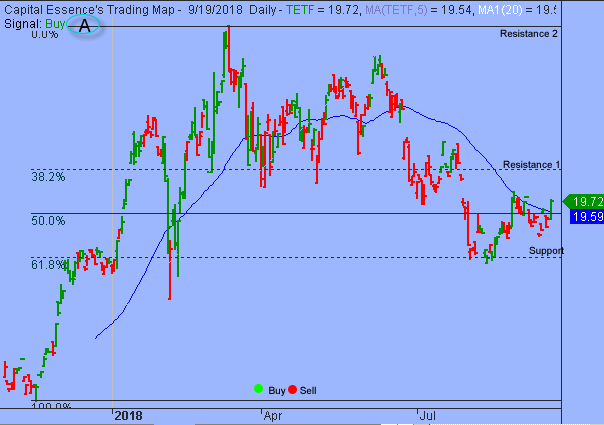 Market Trading Map” painted TETF bars in green (buy) – see area ‘A’ in the chart. The first dominant feature on the chart is the rising trend line starting in late 2017. The second dominant feature of the chart is the downward trend since early 2018. The June downswing found support at the 61.8% Fibonacci retracement. Wednesday’s rally pushed the ETF above the 50-day moving average, signify a bullish reversal. This is a positive development, opened up for a test of the 38.2% Fibonacci retracement, around 20. A sustain advance above that level could trigger acceleration toward the 2018 high, around 21.60. TETF has support near 19. Short-term traders could use that level as the logical level to measure risk against. Short-term technical outlook remains bullish. Last changed September 18, 2018 from slightly bearish (see area ‘A’ in the chart). S&P basing sideways near the important sentiment 2900 mark. Momentum indicator is fast approaching the level that has been successful in repelling price actions over the past few months, suggesting market is due for some kind of a pullback the way we had in June, July and August. For now, 2900 is the line in the sand. This level was tested several times over the past weeks. This history indicated an important role in terms of support. A close below that level has measured move to around 2850, based on the trend channel moving average. That’s about 2 percent pullback, the way we’ve had over the past few months. So it would be a normal, probably refreshing activity to have come down. Perhaps the positive Money Flow measure is the best illustration of the bull’s case. Short-term trading range: 2850 to 2926. S&P has support near 2900. A close below that level will trigger a short-term sell signal with downside target near 2850, based on the trend channel moving average. The index has resistance between 2916-2926, or the lower boundary of the red band. In summary, S&P developed a high volatility with fast up and down moves between the lower boundary of the red band and the trend channel moving average. While market seems vulnerable to some downside retracement over the short-term, we’re long-term positive for S&P as we believe selloff would be shallow and quick.